Now that I am back from a very exciting SHEAR weekend, I have been reviewing my notes and processing all of the ideas that percolated during three days of panels. Not only do I have great suggestions for my own work, but I am inspired by other projects and methods I observed over the weekend. While I enjoyed all of the panels I attended, one in particular grabbed my attention. Panel 20: The Art of History in an Age of Revolution was fantastic. 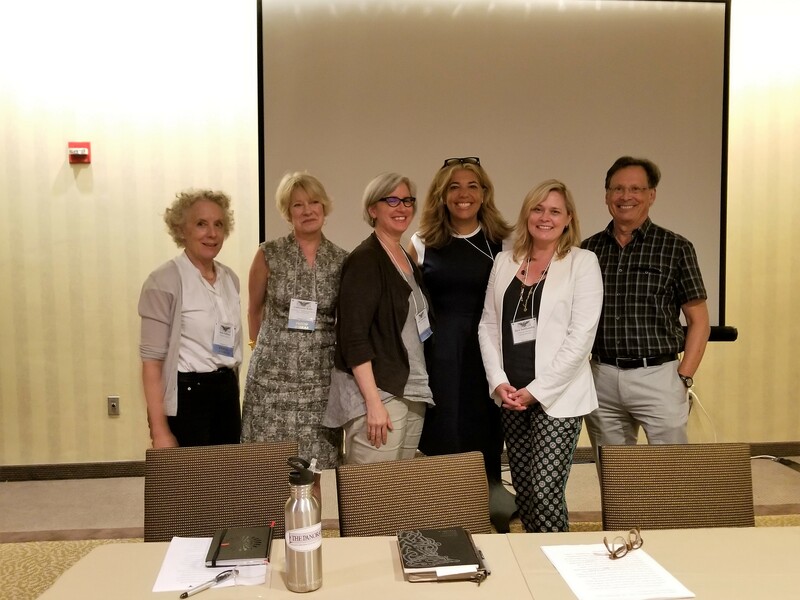 Gwendolyn DuBois Shaw presided over a panel that included Zara Anishanslin (University of Delaware), Jane Kamensky (Harvard University), Cathy Kelly (University of Oklahoma and the Journal of the Early Republic), and Paul Staiti (Mt. Holyoke College). Ann Fabian (Rutgers University) provided an insightful comment at the end. Yet this was no ordinary panel, it was really more of a roundtable. Each participant shared a piece of art, or a few, from their work and then explained how they use it to unlock a story or approach to history. Anishanslin shared a portrait of Anne Shippen Willing. She explained how she used the portrait to create an imagined community between the subject (Willing), the painter (Robert Feke), the weaver of the silk (Simon Julins), and the artist behind the silk design (Anna Garthwaite). By exploring these individuals, she was able to reveal deep connections between various communities in the eighteenth century Atlantic World. Jane Kamensky showed a portrait of John Singleton Copley and told the story of his life in the middle—the middle of communities, the middle of families, and the middle of empires. Paul Staiti showed a portrait of George Washington and compared many of its features to a famous portrait of King George III. These pictures replaced the images that defined the British Empire and suggested what a republic should look like. Cathy Kelly ended by exploring a republic created from taste by also showing a series of portraits. Kelly argued that “taste” told Americans where to look, how to view things around them, and to read text. For example, a portrait of George Washington guided citizens how to shape their identity and replicate his greatness. After the short presentations Ann Fabian asked a few questions to start the conversation. How do visuals differ depending on what artist or figure we consider? When analyzing an image and its historical significance, how do you get from looking and seeing to fighting and working? Who and what do visuals leave out? Given the deluge of image in today’s society, are students good interpreters of visuals? How have they surprised you with their interpretations? The conversation with the audience largely centered around how to use visuals in the classroom and why more historians need to engage with visuals (and do so more effectively). The discussion was riveting and I encourage you reach out to the panels for their thoughts and read the tweets on the panel by many of the audience members. (See #PN20 on Twitter). I also storified my live tweets from this panel. As an audience member, I had some observations about why this panel was so compelling. This panel was the last of a long day of sessions and stood in between the audience and cocktails. Yet, the audience was captivated, so clearly the panelists did a few things right. I have four take-aways for future panels. The participants. Unfortunately this suggestion makes the panel hard to replicate. The panelists were special. They are established, successful historians that can speak to both scholarship and teaching. They were funny, engaging, passionate, and some of the smoothest presenters I have seen. The combination of art historians and historians that use art proved to be particularly useful to the conversation as well. The audience asked questions, they did not proselytize or provide comments. I know this complaint is evergreen, but it was refreshing to hear an audience that genuinely wanted to engage the panelists. The commenter provided open-ended questions for the panelists to consider and the panelists actually responded to them and to one another. They did not ramble off topic. One person did not dominate the conversation. They gave thoughtful, detailed responses, but were mindful of the length at which they spoke. There has been much discussion in SHEAR and other organizations about how to liven up conferences and move away from the paper presentation format. This panel demonstrated one option for alternative formats that although difficult to recreate, can be wildly successful when done right.